When you think of a web design and development firm, the first thing that comes to your mind probably isn't "in-house audio/visual studio," but we have one at Bass Rocks! If you're making a multimedia website, in need of a recording studio for your next big hit, or if you're marketing a children's television program, we've assembled a state-of-the-art control room to capture, enhance, and reproduce your audio and video projects. We're really excited about this latest addition to our business, and we've already been putting it to great use in projects like restoring audio and producing audio book chapters for Joseph Garland's book Unknown Soldiers: Reliving WWII in Europe. We have also shot video on location for author events at Rockport Public Library, and prepped it for the web. 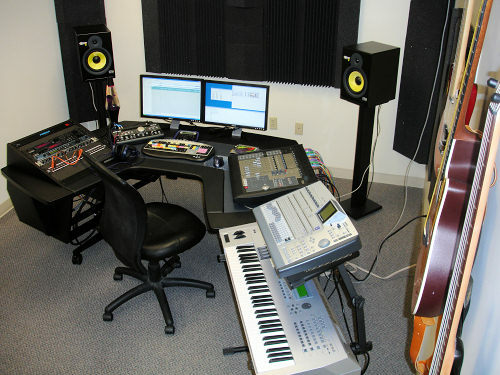 Our in-house studio is acoustically treated and loaded with the latest and greatest in audio/visual gadgets. You can come to us or we can come to you; whether you need a videographer for a special event, or want to stream audio on your website; or, if you’re in the area and just want to come check it out. (We admit, we like an excuse to show it off to people.) Besides, audio and video are great tools to get your message across, and we make it easy and affordable to include these on your website.